Myanmar's authorities have postponed a visit by UN officials and diplomats to Rakhine state, which has seen a mass exodus of Rohingya Muslims. A UN spokesman in Yangon initially told the BBC no reason was given, but later said it was due to bad weather. The spokesman said the UN had been told the government-organised trip would happen next week. More than 400,000 Rohingya have fled across the border to Bangladesh since violence began on 25 August. UN aid personnel were forced to leave Rakhine when the military responded to attacks by Rohingya militants with a crackdown. 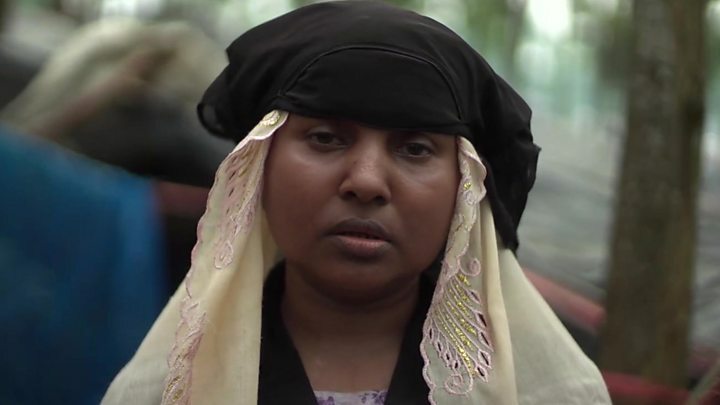 Rohingya who have crossed the border accuse Myanmar's military, backed by Buddhist mobs, of trying to drive them out with a campaign of beatings, killings and village burnings. Images and reports from journalists confirm many villages have been razed. Dozens of Rohingya have died trying to get to Bangladesh and on Thursday, at least 14 Rohingya were reported to have drowned after the boat they were travelling in capsized. The police said nine of the victims were children and the rest were women. 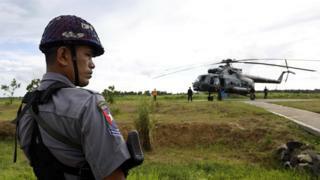 But Myanmar's military say they are targeting only militants in Rakhine. Earlier this week, they said bodies of 45 Hindus killed by Rohingya militants had been found in a mass grave. Assessing the situation on the ground in Rakhine is difficult because access is tightly controlled. But humanitarian groups say that, in addition to those who have fled to Bangladesh, many people are displaced within Rakhine and hundreds of thousands lack food, shelter and medical care. The UN has been pushing to get back in to assess the situation on the ground. UN spokesman Stephane Dujarric had said on Wednesday, before the postponement, that he hoped the visit would be "a first step towards much freer and wider access to the area". The Rohingya, a mostly Muslim minority, are denied citizenship by Myanmar, which says they are illegal immigrants. Rakhine Buddhists are the majority in the state and deadly communal violence has erupted several times in the past. Later on Thursday, the UN Security Council will meet in New York to discuss the crisis. Myanmar's de facto leader Aung San Suu Kyi has faced strong international criticism for her government's handling of the situation. On Thursday UK Foreign Office minister Mark Field met Ms Suu Kyi and urged her to end the violence.